Litho Offset. Amstar Company, Inc. Perf. 14. Although ozone (O3) is present in small concentrations throughout the atmosphere, most ozone (about 90%) exists in the stratosphere, in a layer between 10 and 50km above the surface of the earth. This ozone layer performs the essential task of filtering out most of the sun’s biologically harmful ultraviolet (UV-B) radiation. Concentrations of ozone in the atmosphere vary naturally according to temperature, weather, latitude and altitude. Furthermore, aerosols and other particles ejected by natural events such as volcanic eruptions can have measurable impacts on ozone levels. Minimize high altitude aircraft flights (oxygen reduction and water vapor deposition). Minimize rocket flights (water vapor deposition). Encourage growth of plants that produce oxygen, discourage deforestation. Decrease / control releases of high temperature steam / moisture to the atmosphere. Eliminate production and release of known ozone depleting chemicals (such as CFCs and HCFCs) where remotely possible. Subsidize production of safer alternatives where possible. Establish controls to assure that new compounds to be used in high volume, are surveyed for effect on ozone. 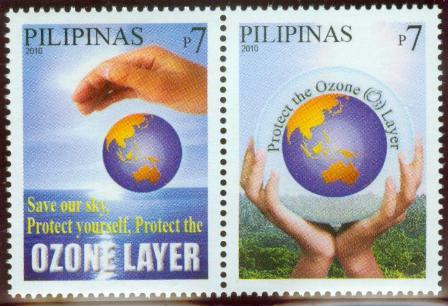 Save our sky, protect yourself, protect the ozone layer.